A wonderfully simple exploratory activity for little scientists that incorporates plenty of scientific thinking. 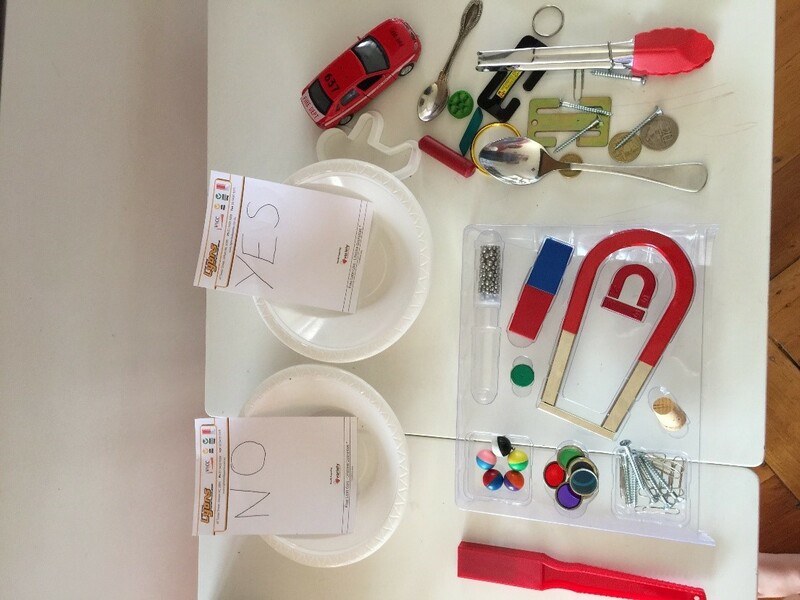 An assortment of metal and non-metal household items such as: A key, some coins, a food can, a soft drink can, a metal spoon, a wooden spoon, a gold or silver necklace, a paper clip, aluminium foil, a baking tray, a metal toy car, a plastic toy, a small piece of wood, a small glass marble or glass jar, a rubber band, and a cork. Two large bowls or containers, labeled ‘Yes’ and ‘No’. 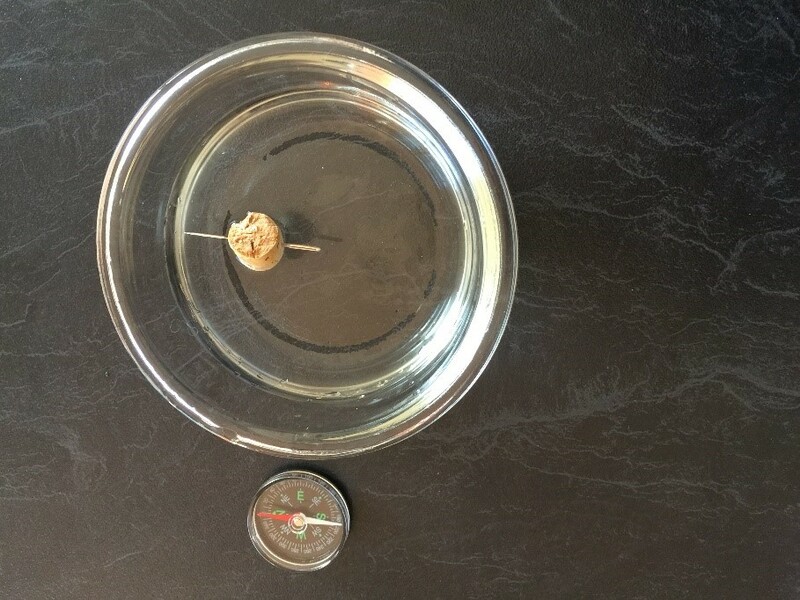 Turn an ordinary sewing needle into a compass, with the help of a magnet. Place some water in the bowl so the cork/foam can float easily. Hold the needle firmly on the bench with one finger on one end. Take the bar magnet and stroke the needle firmly with the South pole end, all the way from the eye to the tip. Do this at least 50 times, stroking the whole length of the needle in the same direction each time. Push the needle through the middle of the cork/form, then float it gently in the water. Allow the needle to orient itself. If you place a compass next to the bowl, you will find the compass needle and the floating needle will be pointing in the same direction – North. CAUTION: Do not hold the wire on the battery for long periods without removing it. The wire and/or the battery terminal may get hot. The nail is sharp, handle with care. Wind the plastic coated wire tightly around the nail about 40 times - more turns makes a stronger magnet. It doesn't matter if the wire turns overlap. Hold one end of the stripped wire to one end of the battery (terminal), and the other end of the stripped wire to the other battery terminal. 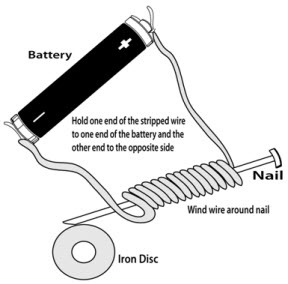 With the wire connected to the battery, pick up your metal object (washer or paper clip) with the sharp end of your new electromagnet. Matchsticks (non-safety or 'strike anywhere' matches with the red head. work best). Open up a matchbox and select a number of matches. Place the neodymium magnet onto the heads (red) of the matchsticks. You'll observe that they do not attract or move towards the magnet. 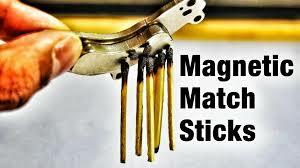 Burn the matches by striking them as normal, once head of match is burned you can extinguish it by blowing air onto it. Now repeat step 2 and place the magnet onto the matchstick heads, you should observe that they're attracted to the magnet! But how?